Before Slipknot wore identical coveralls, Corey wore a priest costume. This earned him the nickname "Faith", which he still hates to this day. Every month, Corey writes a column for the British rock magazine, Rock Sound. 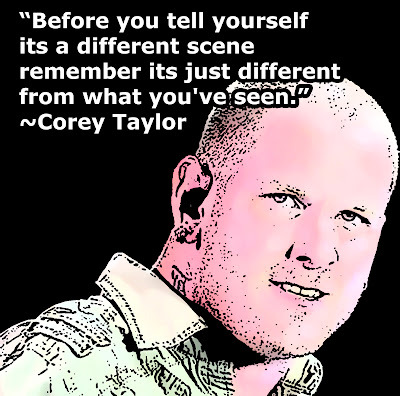 Corey appeared with his band, Slipknot, in the 2001 remake of the 1975 science fiction film, Rollerball. They played the song "I Am Hated". Corey made guest vocal appearances on Apocalyptica's song "I'm Not Jesus", and the Soulfly song, "Jumpdaf*ckup". Corey has such a large collection of comics and action figures he had to move it into a storage space. Corey's current mask has decreased the muffling of his voice which the older one caused. Corey's original mask, which was initially made from a 'Crash Test Dummies' halloween mask, was equipped with brown/blonde dreadlocks. Some of the dreads were his real hair, which he used to pull through the mask. He later cut them off due to it being very painful to pull them through, and because of his ever-changing hairstyle.